Libyan Leader Muammar Gaddafi finally dies after being shot in hiding place, Sirte is very surprising. “Muammar Gaddafi dead of wounds suffered in the arrest near Sirte,” The veteran strongman was killed on as new regime forces crushed the last pocket of resistance in his hometown Sirte. Today many sites reported about the death of this dictator libyan leader Gaddafi. Beside gaddafi his son mutassim gaddafi also dies, the commander of the Libyan Government Spokesman also claimed another Gaddafi's son, Moussa Ibrahim, arrested. Previous revolutionary forces pounded the city hideaway Gaddafi, Sirte. 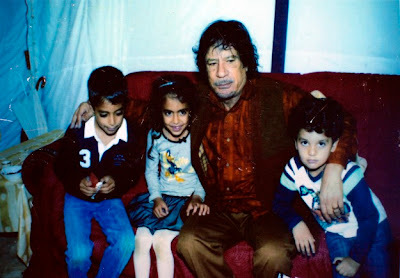 Shortly after Muammar Gaddafri has reported dead, Muammar Gaddafi dead photos circulated widely in the internet. The photos were aired by some television stations. The Muammar Gaddafi dead photos show a number of foreign televisions it was the same, You can see the bloody and pale gadddafi corpse . In the photo it appears someone tried to lift the corpse. The photo was snapped by a video camera display. 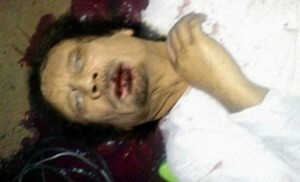 Libyan military officials confirmed that the dead man’s body image is the real muammar gaddafi. So What do you think about the death of Muammar Gaddafi?? what will happen next in Libya? On the name of terrorism, they just want to capture all the countries and put their associates there, so that they can rule and get whatever they want. Same thing he did with Iraq, if Saddam was creating weapons they why they didn't use any single weapon and nothing is found after investigation. I believe that on day they will try to capture India by providing aids to the countries like Pakistan, Bangladesh and Afghanistan. They are trying to place their Army surround to India. And our Political leaders, Government, all Parties are corrupt, so they will help them to capture India.